One-to-One Correspondence - Matching Identical Objects! One-to-One Correspondence – How Are You Feeling? Are you happy, sad, mad, or really angry today? Draw a line to the matching moody faces. Color. 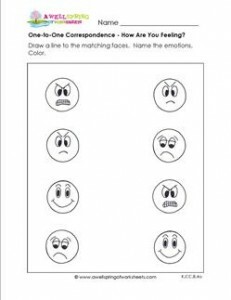 Please go to this page to see all the one-to-one correspondence worksheets on this site.